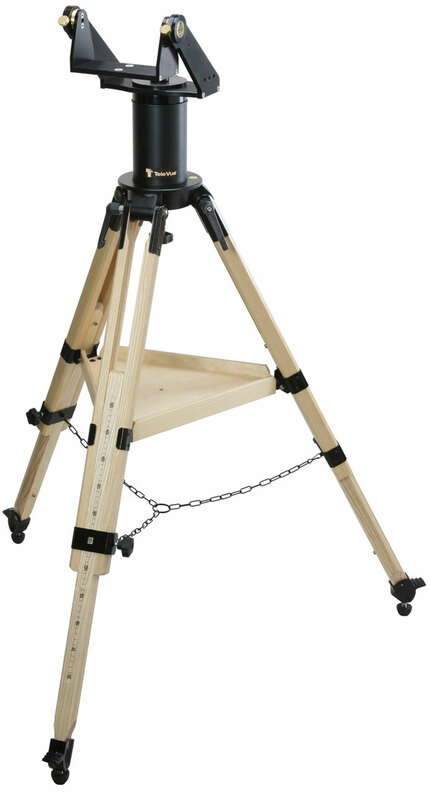 The large bearing surfaces and thick wood legs of the Gibraltar HD tripod handles the load for high power viewing. Leg extensions raise the altitude axis to 5-feet, still ideally sized for use with our Air-Chair observing stool. Scale on leg extensions allows repeatable setting to desired height. A wood accessory tray ties the legs together for rigidity. Built-in pier allows for high-altitude viewing. A bubble-level is integrated into the tripod base. Metal ground spikes with rubber tips are provided. Gibraltar HD5 accepts all accessories including Sky Tour (spacers STS-5002 required to fasten the azimuth encoder cover to the wider baseplate).